Now that we have discussed the advantages of powder coating and the benefits of bringing your coating system in house, it’s time to talk powder. There are a number of different kinds of powder available, and selecting the right one is a key component to your finishing operation. When we talk about powder quality and performance, we always reference the powder’s base resin. The base resin is what the powder is made of (polyester, epoxy, etc) and will greatly impact two things: the final coating quality and your pretreatment process. Depending on the specific performance criteria of your customer or your parts, there are multiple base resin qualities to be considered. We always recommend researching your requirements and deciding on your powder quality prior to purchasing equipment so that you don’t buy the wrong size oven or the wrong pretreatment solution. The most widely used base resin for powder coating is polyester. Polyester has great exterior durability, good hardness, excellent chemical resistance, and is fairly easy to cure. Most start-up powder coating operations use a form of polyester due to its performance, affordability, and ease of application. Low-Cure: Can be cured at 325F-350F. Lower cure temperature helps with some under powered ovens or quick cure applications. The downside of low cure is shelf life reduction and reduced performance. Super-Durable: These polyesters have specific resins for longer retention of gloss and improved color fade resistance. They are used for exterior equipment applications such as high end tractors and trucks. They also use specific pigments that are designed to be UV ray resistant. This improvement comes at a higher price and may have tighter application tolerances. TGIC-Free: Most polyesters are made from a TGIC resin. Certain architectural specifications require TGIC-Free polyester powder coating. They are usually a little higher in price and have tighter application specifications, but they may be less sensitive to cross-powder contamination. Hybrid powder coatings are a mix of polyester and epoxy resins. Most of your special effect coatings are this quality due to the pliability of the formulation. River textures, metallics, base coats, veins, and other effects are possible with this quality of powder. They are primarily for indoor applications since the epoxy part can degrade with exposure to UV radiation. Some formulations allow polyester clear coats to be applied after the hybrid coating for exterior quality. Hybrids are usually less expensive than polyesters and usually have lower cure temperatures. Epoxy powder coatings are used for parts that need superior chemical resistance but will not be exposed to sunlight. Under hood car parts, pipelines that are buried, and interior lab components are some common applications for epoxy powder coating. Powder primers are typically made from epoxy resins due to their affordability and extreme salt-spray performance. They usually are cured at lower temperatures than polyester and can be partially cured in the case of primers. Urethane powder coatings are used for high end parts that need great flexibility and exterior sunlight exposure performance. Typical applications for urethane powder coatings are marine exterior components, tight tolerance automotive parts, and impact-resistant surfaces. They are usually much higher in price than typical polyesters and are for specific applications that need them. Application is fairly normal with cure times similar to polyesters. Kynar™ powder coatings are used primarily in aluminum applications on the outside of high-rises or anywhere that requires a ten year warranty against gloss loss and color fade. They are extremely expensive and difficult to apply correctly. They require specific pretreatment and applicators must be certified by the powder supplier with extensive testing be fore the powder coater is even approved to use the powder. 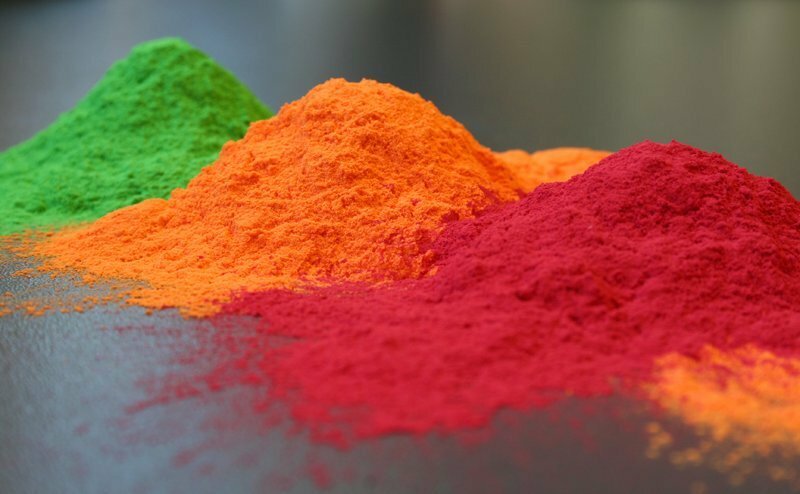 Using this guide will help you determine the powder you need for the most common powder coating applications. However, if your process is very specific, you may also use acrylic coating, high-temp powders, and/or blends of the above resins for certain specialty purposes. Again, we always recommend researching your customer’s requirements (longevity, gloss, salt-spray resistance, etc) prior to making your powder or equipment purchase as it will determine the cure time, pretreatment required, and the application amount of the specific powder. Once you’ve determined exactly what sort of powder and pretreatment you need, it’s time to plan your powder coating system. If you need assistance in planning please give one of our systems specialists a call. This entry was posted in News on August 24, 2015 by Bruce Chirrey.